Many of us remember the hit TV show “Happy Days,” which ran from 1974 to 1984 and concerned the exploits of a group of teenagers in the 1950s. When Richie, Potsie, Fonzie and friends wanted to hang out, they went to Arnold’s soda fountain. The scene wasn’t much different during the 50s and 60s at Issaquah’s soda fountains. Two of the most popular were located more or less across Front Street from each other in the block just north of Mill Street (now Sunset Way). The Honeysuckle was on the west side of the street; the Shamrock on the east. Both were places where teenagers could do the things they like to do when they get together; eat, listen to music, and chat about school, sports, cars, movies, and who’s dating whom. Both of them served up such popular drinks as green rivers (lime syrup and carbonated water), graveyards (a mix of syrups and carbonated water), root beer floats and milk shakes. Kids from the high school liked to drop into both of them at lunchtime or after school. The Honeysuckle, which opened its doors in 1922, was operated by Tom Drylie for 36 years, and later by Rita and Dave Morris. It was a strict soda fountain / candy shop for most of its existence and also doubled as the local depot for the Greyhound and Trailways bus lines. The Shamrock, itself originally a soda fountain named Jays, added short-order food and homemade pies when it was bought by Mike and Rena Shain in the 1940s. 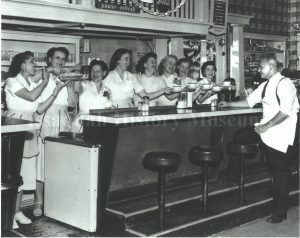 According to Marilyn Batura, Susan Cameron, and Chuck Olson, the Honeysuckle tended to attract the “greasers” with their black leather jackets, while the Shamrock was home territory for the “Soshes” or “socials” (although both had adult customers as well). As a bus station, the Honeysuckle also attracted its share of transients and out-of-towners, including a jewelry salesman who used to dance around the floor by himself, swinging his sample case. The Shamrock had its fans as well. Nancy Horrocks remembers that Rena Shain “made the best chocolate cake in captivity,” while Bob and Lois Catterall state that “no one has come close to Rena’s meringue pie.” The only complaint by some was that you had to order 50 cents worth of fare to get a booth.